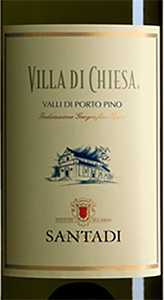 The 'Villa di Chiesa' by Cantina Santadi is a 'Valli di Porto Pino' IGT and comes from a careful selection of grapes from the local Vermentino with the noble Chardonnay. Moving on to an aging period of 9 months in French oak barrels, it comes out with a soft and savory white, which gives the finish a pleasant note of vanilla and citrus. THE WINE The 'Villa di Chiesa' by Cantina Santadi is a 'Valli di Porto Pino' IGT and comes from a careful selection of grapes from the local Vermentino with the noble Chardonnay. Moving on to an aging period of 9 months in French oak barrels, it comes out with a soft and savory white, which gives the finish a pleasant note of vanilla and citrus. 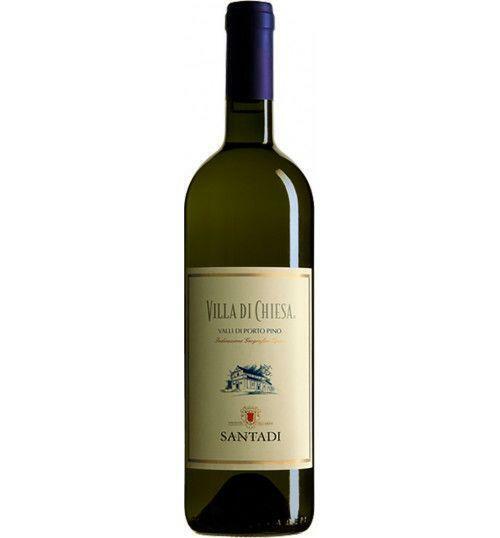 THE COMPANY In the heart of Sulcis, in the province of Carbonia-Iglesias, in the south-western part of Sardinia, there is the Santadi Winery. Located in the small medieval town of Santadi, in the lower Sulcis, surrounded by vineyards, olive groves, holm oaks, pines, oaks and junipers, this enchanting area of ​​Sardinia includes coastal stretches from white beaches, hilly hills, flat stretches and mountain ranges. characterized by a Mediterranean climate with granitic and calcareous soils, rich in sediments. A cooperative reality founded by small grape producers in 1960, created with the aim of producing and selling bulk wine, with the arrival of the new president Antonello Pilloni, the Santadi Winery, stands out and focuses on innovation and the quality of its wines. We start from the renovation of the winery and the vinification departments, to get to build and set up a modern laboratory, a purifier and an innovative photovoltaic system. In the 80s, at the helm of the winery and production, he is called Giacomo Tachis, who with passion and determination leads the winery to national and international success. Thanks to his intervention, the production focuses on wines of the highest quality and territorial imprint, with innovative spirit and respect for tradition, favoring the native vines and in particular the Carignano, a particularly widespread vine in the Sulcis area. With the 1984 vintage, the Santadi Terre Brune, the first red barricade of Sardinia, was born from Carignano, which rests in new, fine-grained oak barrels for a period of 16-18 months and ages for 12 months in bottle. But at Santadi Winery, in Sardinia, there is not only the Carignano del Sulcis, but also other native and international vines, such as cannonau of Sardinia, nasco, nuragus, vermentino, monica and cabernet, merlot, chardonnay and syrah, always with the aim of offering wines of the highest quality from the different organoleptic characteristics and from the different terroir of belonging. Thus, at the Santadi winery, generous wines are born, in balance between rural tradition and innovation, territorial expression and strong personality, such as the Rocca Rubia, the Latinia, the Norona Cannonau and the Liquore Wine Festa Noria Santadi, obtained from autochthonous red grapes . Tasting Color: bright straw yellow. Bouquet: notes of exotic fruit, buttery, toasted and creamy tones. Taste: soft and savory, with good persistence, vanilla and citrus aftertaste. In the heart of Sulcis, in the province of Carbonia-Iglesias, in the south-western part of Sardinia, there is the Santadi Winery. Located in the small medieval town of Santadi, in the lower Sulcis, surrounded by vineyards, olive groves, holm oaks, pines, oaks and junipers, this enchanting area of ​​Sardinia includes coastal stretches from white beaches, hilly hills, flat stretches and mountain ranges. characterized by a Mediterranean climate with granitic and calcareous soils, rich in sediments. A cooperative reality founded by small grape producers in 1960, created with the aim of producing and selling bulk wine, with the arrival of the new president Antonello Pilloni, the Santadi Winery, stands out and focuses on innovation and the quality of its wines. We start from the renovation of the winery and the vinification departments, to get to build and set up a modern laboratory, a purifier and an innovative photovoltaic system. In the 80s, at the helm of the winery and production, he is called Giacomo Tachis, who with passion and determination leads the winery to national and international success. Thanks to his intervention, the production focuses on wines of the highest quality and territorial imprint, with innovative spirit and respect for tradition, favoring the native vines and in particular the Carignano, a particularly widespread vine in the Sulcis area. With the 1984 vintage, the Santadi Terre Brune, the first red barricade of Sardinia, was born from Carignano, which rests in new, fine-grained oak barrels for a period of 16-18 months and ages for 12 months in bottle. But at Santadi Winery, in Sardinia, there is not only the Carignano del Sulcis, but also other native and international vines, such as cannonau of Sardinia, nasco, nuragus, vermentino, monica and cabernet, merlot, chardonnay and syrah, always with the aim of offering wines of the highest quality from the different organoleptic characteristics and from the different terroir of belonging. Thus, at the Santadi winery, generous wines are born, in balance between rural tradition and innovation, territorial expression and strong personality, such as the Rocca Rubia, the Latinia, the Norona Cannonau and the Liquore Wine Festa Noria Santadi, obtained from autochthonous red grapes .